[CBC NEWS] Thailand's prime minister warned on Tuesday that Bangkok could be swamped by up to 1.5 metres of water if flood walls fail. Prime Minister Yingluck Shinawatra warned in a televised address that in a worst-case scenario, the enormous pressure of floodwaters pushing downstream into the city could combine with monthly high tides this coming Friday and Saturday to overwhelm recently reinforced flood walls and embankments protecting the city. She said that could result in flooding of up to 1.5 metres in low-lying areas of the capital. Bangkok Gov. Suhumbhand Paribatra said the capital cannot escape flooding and warned residents of 13 districts along the Chao Phraya river, the city's biggest waterway, to be prepared. Earlier, advancing floodwaters breached barriers protecting Bangkok's second airport Tuesday, halting commercial flights at a complex that also houses the country's flood relief headquarters and thousands of displaced people. 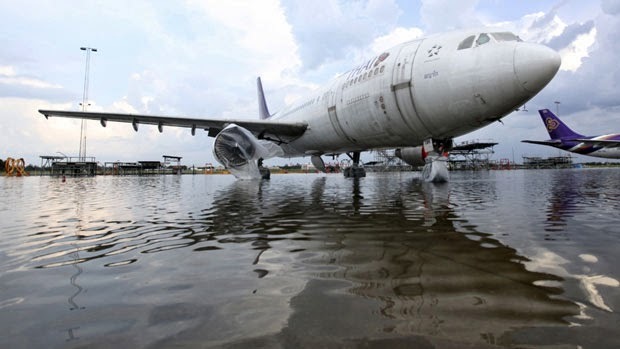 The flooding at Don Muang airport, which is primarily used for domestic flights, is one of the biggest blows yet to government efforts to prevent the sprawling capital from being swamped. Its effective closure is certain to further erode public confidence in the ability of Shinawatra's administration to defend the increasingly anxious metropolis of nine million people. 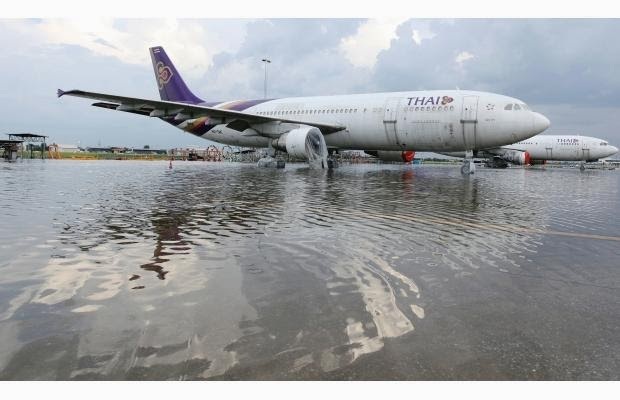 Bangkok's Suvarnabhumi Airport, the country's main international gateway, has yet to be affected by flooding and flights there were operating normally. Most of the city has been spared inundation so far. Don Muang has come to symbolize the gravity of the Southeast Asian nation's deepening crisis, which has seen advancing waters drown a third of the country and kill 366 people over the last three months. The airport houses the government's recently established emergency Flood Relief Operations Center, and one of its terminals has been converted into an overcrowded shelter filled with tents for about 4,000 people who fled waterlogged homes. Somboon Klinchanhom, a 43-year-old civil servant who took refuge there last week, was preparing to move after authorities said the terminal had become too crowded and thousands of people displaced there would be relocated. "I thought it would be safe and well-protected," Somboon said of the airport, as she packed her belongings again. The Thai government has declared Oct. 27-31 a public holiday for 21 flood-affected provinces, including Bangkok. Thai news agencies say the holiday is meant to give people time to deal with the flooding, as well as time to prepare for the high tide, which could make flooding worse in some areas. Bangkok-based reporter Michael McAuliffe said forecasters are calling for thunderstorms as early as Thursday. "That could have a big impact on how seriously the flooding is extended," McAuliffe says. The Bangkok Post says Thai MPs will meet Wednesday to discuss efforts to deal with the floods. 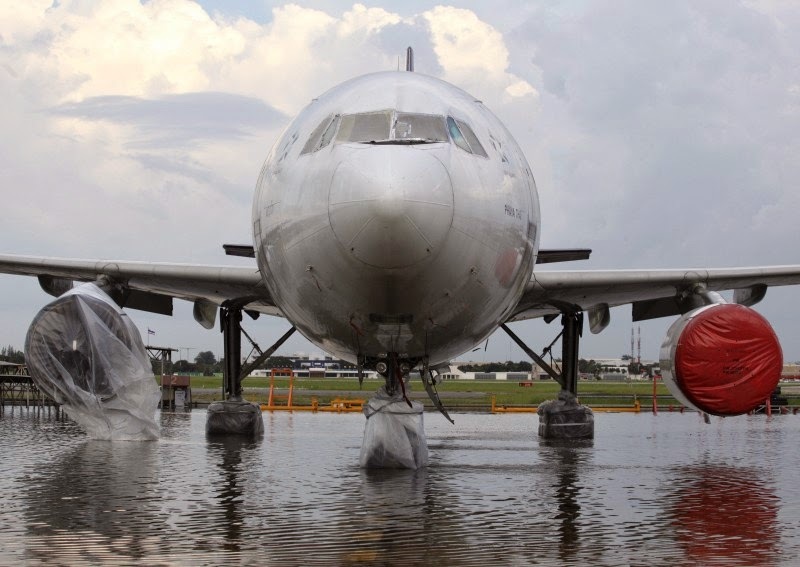 Though floodwaters have yet to spill across Don Muang's runways, ankle-high water could be seen Tuesday rushing over sandbagged barriers around the airport's perimeter, swamping internal roads. One vast pool was headed toward two Thai Airways jetliners parked outside a hangar, their wheels wrapped in plastic sheets. 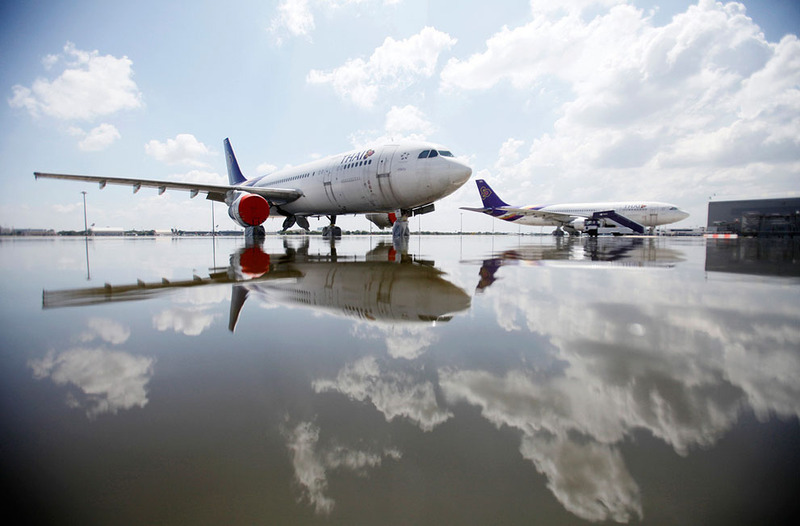 The two main carriers based at Don Muang announced they were suspending operations and diverting flights to Suvarnabhumi because of the flood threat. 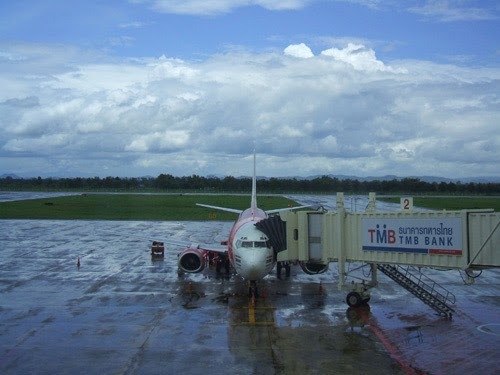 They are Thai Orient Airlines and Nok Air, which said it was halting flights until Nov. 1. Capt. Kantpat Mangalasiri, the airport's director, said Don Muang's commercial runways would be closed until Nov. 1 to ensure safe aircraft operations. Thai air force flights carrying relief supplies were continuing on a military runway that is still open, air force spokesman Montol Suchukorn said. He said floodwaters had breached the military's air base, but the runway remains protected by flood barriers. Last week, the air force moved 20 planes from Don Muang as a precaution. 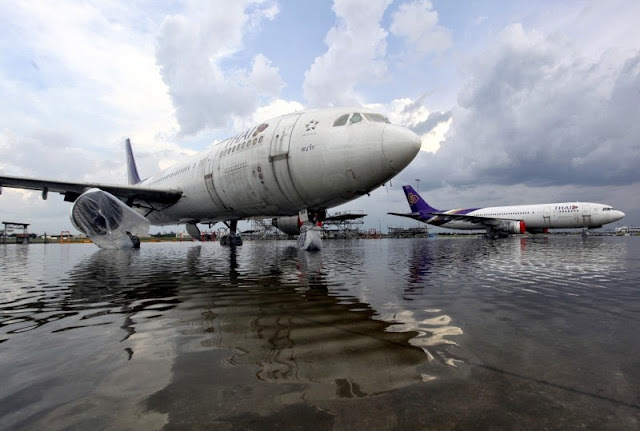 The government's flood relief command will remain at the airport for now since it is still accessible by road, spokesman Wim Rungwattanajinda said. He said the government expects floodwaters will sweep through the main parts of Don Muang by Friday, but would not rise above one metre. 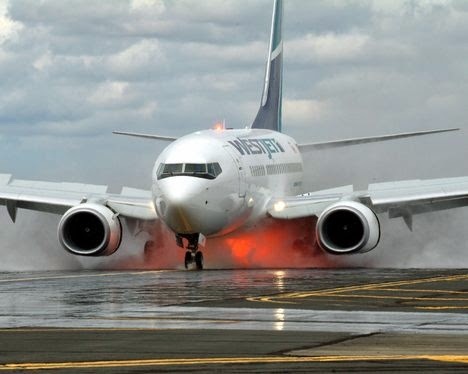 The scene at the domestic terminal was chaotic as throngs of confused passengers struggled to leave or pulled up to the departure hall with luggage, unaware their flights had been cancelled. With parts of the main road heading to downtown Bangkok flooded knee-deep, taxis were in scarce supply. Some travellers waited hours for a ride as airlines scrambled to arrange special buses.